A tapenade is a seasoned condiment in Provence made of mashed black olives, capers, salted anchovy, preserved tuna, and olive oil. Traditionally, it has only been used for spreading on bread as a snack or appetizer or as an accompaniment to raw vegetables. 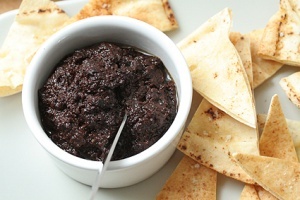 A simpler version of tapenade is known in Italy as caviale di olive, olive caviar. The word tapenade derives from the Provençal word tapéno, meaning capers. Keep the tapenade stored in the refrigerator covered by an 1/8-inch-deep layer of olive oil to preserve it, where it will keep for several months. 1. Place all the tapenade ingredients in a food processor with 6 tablespoons of the olive oil and process until smooth. Taste and add more olive oil if necessary. Do not add salt because all the ingredients are salty enough. 2. Serve with the garlic-rubbed toasts. Clifford A. Wright... is a memorable, marvelous writer.